The money raised at the 5th Annual Casino Night fund Boston public high school students to work in legal service and government agencies through the BBA Summer Jobs Program. 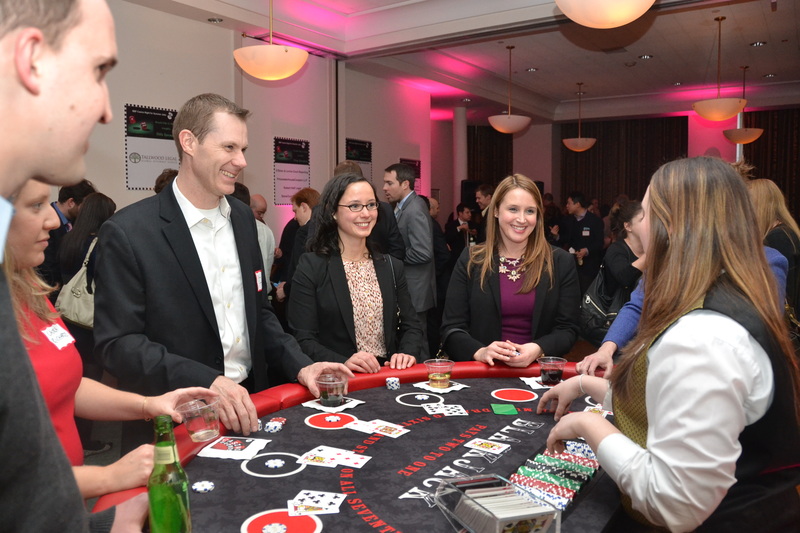 Last Thursday, 250 attorneys came to 16 Beacon for a night of gambling and socializing for the 5th Annual Casino Night for Summer Jobs fundraiser. While the event has always supported the Boston Bar Foundation, this year all of the funds will specifically support the BBA Summer Jobs Program. As you may remember, the BBF funds Boston public high school students to work in legal service and government agencies each summer. The BBF-funded students not only get the opportunity to receive hands on experience in the legal field, but the legal service and government agencies benefit from the student’s enthusiastic help in a busy office environment. Take a look at the experiences of last year’s students here. Between sponsors, ticket sales and our silent auction the BBF raised nearly $40,000 last night to support the Summer Jobs program and put 12 students to work this summer. Twenty companies demonstrated their commitment to Boston’s youth through sponsorship of the event, contributing over $25,000 to the BBF (enough to put eight teens to work this summer). Do you want to see more highlights from the night? Click here.